Italian/Greek Campaign: Mussolini pays another visit to Albania, flying in on 2 March 1941. This is another attempt by the fascists to raise Italian troops morale in Albania, which in fact has been on the rise due to the successful stand at Klisura. 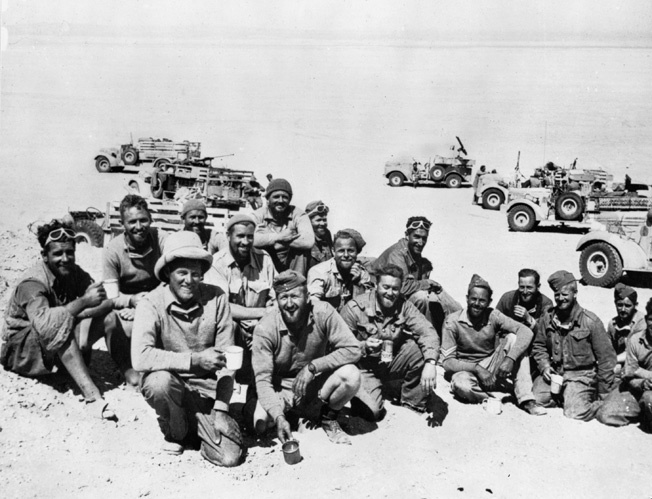 The British in Cairo are gathering together the forces and shipping for the expedition to Greece. These are assembling as W Force Operation Lustre, under the command of Lieutenant-General Sir Henry Maitland Wilson. This collectively will be known as Lustreforce, and the first convoy is scheduled to leave for Greece within a couple of days. Due to recent developments in Bulgaria, which are an obvious indication that the German invasion of Greece is not far off, the Greeks now wholeheartedly welcome British troops. The German troops of 12th Army have entered Bulgaria by crossing the Danube. The Wehrmacht's civilian-clad advance forces have the entire border area scouted, and the troops quickly take up positions along the border. However, there are still many ducks to line up before Hitler is ready to invade, including clarifying the situation in Yugoslavia and Turkey, assembling all of the necessary logistical support, and waiting for the weather to improve. Italian bombers attack Larissa, north of Athens, again. The RAF units around Athens shoot down five of the bombers for no loss. East African Campaign: At Keren, both sides are bringing forward reinforcements. The Italians add the 6th Colonial Brigade and the 11th Blackshirt Battalion of the Savoia Grenadiers - both premier formations. The British, meanwhile, bring forward the 5th Indian Infantry Division (Major-General Lewis Heath) which had been sent back to the railhead during February. The Italians now have 25,000 troops to 13,000 for the British, but numbers alone mean little in this conflict. What does matter is the willingness to fight and the quality of defensive positions, and, for a change, the Italians have both in abundance at Keren. The British troops in Italian Somaliland continue occupying the region against scattered resistance. The final objective is Ferfer, north of Mogadishu. The Italians are retreating - fleeing - to Abyssinia, which is the seat of Italian power in East Africa. At Mescelit Pass, which the British took on the 1st, the British do not know what awaits them on the plateau beyond. They send patrols ahead to to discover what the Italians may have in store for them. An early Grumman F4F Wildcat undergoing tests at NACA Langley, March 1941. NACA is the National Advisory Committee for Aeronautics, the predecessor of NASA. European Air Operations: RAF Bomber Command raids Cologne (Köln) and Brest with 130+ bombers. Luftwaffe activity remains light, with isolated fighter-bomber raids in Scotland and eastern England. BOAC has begun covert air flights during the night between Scotland and Stockholm, virtually passing over Luftwaffe airfields. Lufthansa, of course, also maintains regular passenger flights, but they don't go quite so close to enemy fighters. The flights enable a trickle of trade past the German blockade in the Baltic, and also provides a rare source of British input (documents, passengers, special equipment) to isolated Sweden. Sweden happens to be a major producer of ball bearings, and supplies both sides with them throughout the conflict. The flights are rare at first, but increase with time. They get a variety of nicknames, including "The Ball-bearing Line" (for the cases of ball bearings flown out of Sweden) to "Bashful Gertie, the terror of the Skagerrak" to the official military code name, "Scrutator." The Royal Norwegian Air Transport generally crews the flights, and various aircraft (such as a Polish airline Lockheed 14) are used, with their quality increasing with time, too. While many ascribe this operation to the Air Transport Command of the Royal Air Force and give it the credit, in fact the Air Transport Command is not in existence yet and will not be until 11 March 1943. Battle of the Atlantic: The Germans are busy repairing heavy cruiser Admiral Hipper at Brest. Upon arriving at the harbor, the Hipper struck underseas objects, requiring repairs before she can depart. Brest is too close to England, making Hipper an easy (and frequent) target of RAF attacks. Thus, the Kriegsmarine high command - Admiral Raeder - is drawing the conclusion that Hipper should be brought back to Germany, where it can be better protected and refitted. However, that is no easy matter, because the British are sure to be keeping a close eye on the short route via the English Channel. The only other route is to loop widely around the British Isles through the Faeroes Gap or the Denmark Strait. By choosing one of the latter routes, the voyage will be several times lengthier than it otherwise would be. A small wolfpack is assembled around convoy HX 109 northwest of the Outer Hebrides. It includes U-95, U-147 and U-552. Yesterday, right before midnight on the 1st, U-552 sank tanker Cadillac. The other two U-boats are next in line. U-95 (Kptlt. Gerd Schreiber), on its third patrol out of Lorient and operating north of Rockall, torpedoes and sinks 6034 British freighter Pacific. There is only one survivor and 33 deaths, continuing a recent trend of all or most of the crews perishing. U-147 (Kptlt. Reinhard Hardegen), on its first patrol out of Bergen, spots a straggler from HX-109 about 133 km north/northwest of Ness in the Outer Hebrides (280 km northwest of Loch Ewe). Hardegan torpedoes and sinks 4811 ton Norwegian freighter Augvald. This is the U-boat's first victory. There is only one survivor and 29 deaths - it is difficult to last for long in the frigid waves even if you make it to a lifeboat. Memorial to two of the victims on freighter Castlehill at Tower Hill. The Luftwaffe (a Heinkel He 111 of KG 27) bombs and sinks 690 ton British freighter Castlehill east of Mine's Head in the Bristol Channel. There is only one survivor and nine deaths. The Luftwaffe (I,/KG 40 Focke-Wulf Fw 200 Condors) also bombs and sinks 6533 ton Dutch freighter Simaloer in the Northwest Approaches. British 348 ton freighter Madge Wildfire runs aground at Congress Point on the Isle of Man and is written off. Royal Navy minesweeper Kellett collides with armed boarding vessel HMS Northern Reward and requires repairs lasting a month. Convoy OB 293 departs from Liverpool. 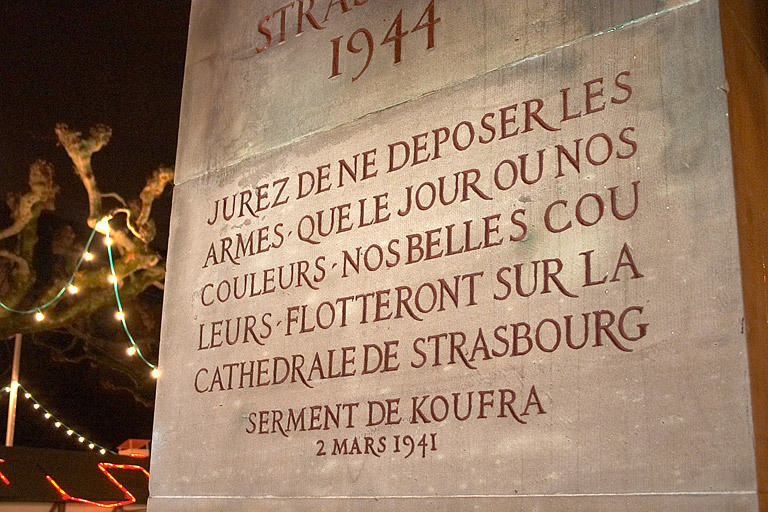 Swear not to lay down arms until our colors, our beautiful colors, float on the Strasbourg Cathedral. This seems like an almost impossible dream. The Free French by themselves have virtually no chance of defeating the German war machine in any kind of reasonable time frame. Even with the British as allies, it is quite a fanciful notion. However, with the right allies, anything might be possible. With the British Army blissfully unaware of any threat that they may pose, the Afrika Korps (DAK) stages a cynical military parade. Before crowds of cheering people, the same tanks roar past, round the block, and roar past again - multiple times. This is a standard propaganda trick which creates an impression of limitless strength. The technique also, incidentally, is used in motion pictures. Attending the parade are General Rommel and all the senior Italian staff in Libya. A staff car fails to stop at a checkpoint near Luqa Airport. The Maltest sentry, as ordered, fires on the vehicle to stop it. Apparently aiming at the drive, the bullet ricochets and hits the passenger in the back seat. It is Lieutenant William Barnes, RN of RAF No. 806 Squadron. Barnes is one of the pilots from HMS Illustrious whose unit was transferred to the ground airfield after Illustrious was severely damaged by the Luftwaffe and forced out of action. In a sense, taking a very broad view, Barnes is the final casualty of that Luftwaffe attack. The Luftwaffe stages what the British might call a Circus raid, sending a large formation of fighters over the island which accompany a lone bomber - which doesn't drop any bombs. The RAF dutifully sends eight Hurricanes up to defend, one of which is damaged. Convoy ANF 16 arrives in Piraeus. 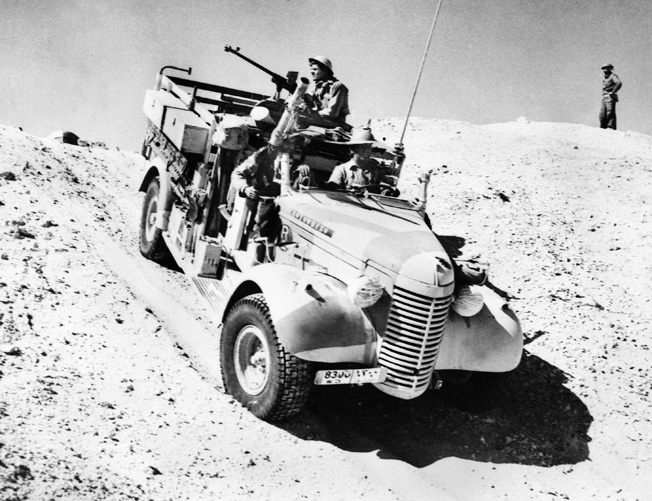 A Long Range Desert Group (LRDG) truck, March 1941. Anglo/Bulgarian Relations: The day after Bulgaria signs the Tripartite Pact, Great Britain severs diplomatic relations. Anglo/British Relations: Foreign Secretary Anthony Eden, back in Athens after conferring with the Turks, follows previous instructions from Prime Minister Winston Churchill and confers with the British ambassador to Belgrade. Churchill wants to try to entice the Yugoslavs into the war by launching a surprise attack on the Italians in Albania, thereby freeing Greek troops to counter the expected German thrust from Bulgaria. The British ambassador, however, says there is no consensus in Yugoslavia to do anything for either side. German/Bulgarian Relations: Prime Minister Filov, back in Sofia after signing the Tripartite Pact on behalf of Bulgaria, announces that German troops have entered the country via pontoon bridges over the Danube "to safeguard peace in the Balkans." The Wehrmacht troops are in Twelfth Arm under the command of Field Marshal Wilhelm List. German/Yugoslavian Relations: Hitler is greatly desirous of expanding the prospective Greek front to encompass the long border that extends from Bulgaria to Albania. He continues to woo Prince Paul, making various promises in exchange for Yugoslav joining the Tripartite Pact like Bulgaria. However, the Yugoslav government and military is hopelessly split between those who want to help the Greeks, and those who prefer to appease Hitler and join the Axis to prevent their country from becoming a battleground. US Government: The US Senate approves an increase in the debt ceiling, from $49 billion to $65 billion. This should require another increase within a year, based on expected spending. Military procurements, of course, are underneath the dramatic increase in debt, with defense spending amounting to a staggering (by pre-war standards) $28.5 billion. The US Senate Committee to study war production issues - known as the Truman Committee (Resolution 71) - now has Tom Connally of Texas, Carl hatch of New Mexico, Monrad C. Wallgren of Washington and James Mead of New York (Democrats), and Joseph H. Ball of Minnesota and Owen Brewster of Maine (Republicans). Churchill grows on me. He has an astonishing grasp of detail and, by daily contact with the service headquarters, knows of disposition and establishment quite accurately. But I still fear that his real tyrant is the glittering phrase - so attractive to his mind that awkward facts may have to give way. But this is the defect of his quality.... Churchill's course is set. There is no defeat in his heart. Many other around Churchill have a similar mixed view of his personality, but overall the general consensus is that his doggedness in pursuit of victory is irreplaceable. 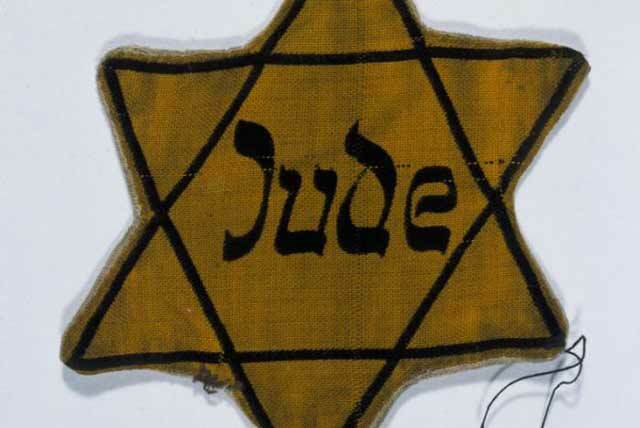 Romania: Continuing to ingratiate itself with Germany, the Romanian government enacts additional repressive laws targeting the Jews. Turkey: The Turks now require permits for all ships transiting the Dardanelles. Chile: In Parliamentary elections, the Radical Party (which actually is merely moderately left of center) gains a plurality. The President remains Pedro Aguirre Cerda of the Popular Front, which is a left-wing coalition that includes the Radical Party as well as the Communist Party and various other worker parties. However, Cerda is wasting away from a tuberculosis. 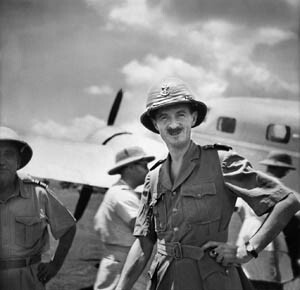 Philippe Leclerc de Hauteclocque in Bangui (now part of the Central African Republic), April/May 1941. March 15, 1941: Cruisers Strike! March 24, 1941: Afrika Korps Strikes! Thanks for visiting! You may also be interested in my World War II In Pictures site, which covers war topics.